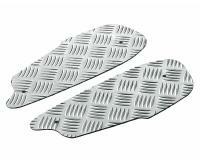 Aluminium foot boards - eye catcher that enhances every scooter’s look! Made from high-quality 4mm aluminium channelled sheet, which fits perfectly. Quintet ribbing on the foot plate provides optimum grip. Is mounted directly to the existing mounting points on the foot well trim of the scooter using the stainless steel screws included Suitable for all Gilera Runner For scooters built before August 2005. Opticparts DF design and produce a vast range of custom tuning Scooter styling parts and modern accessories. The German design house covers some of the best selling Honda, Yamaha, Suzuki, Kymco, Piaggio, Aprilia, and Vespa models! Their range goes from classic chrome and aluminum designs to new modern cutting edge twists with a youth oriented look. Stand out from the crowd with Opticparts DF. Looking for something new and interesting to stock for your scooter dealership or just wanting to get the latest design take a look at Opticparts Scooter Tuning Parts.